This map shows the main military che ckpoints in the West Bank. The Israeli occupation restricts Palestinian freedom of movement both within their country and when they want to leave or return to the country. They do this through physical barriers – the Separation Wall or military checkpoints – and the rulings of military law which is fundamentally discriminatory and gives rights to Israelis including settlers and takes them from Palestinians. Palestinians do not have a state and have no control over international borders, though they experience multiple internal borders from Israeli-controlled checkpoints, no-go areas and divisions between areas. The contrast with the rights of an Israeli settler living on Palestinian land is dramatic. That settler has modern motorways, can use the local airport to fly back and forth to Europe and America in a day, often does not even need visas. Palestinians have pot-holed roads interrupted by military checkpoints, are blocked at every turn by walls, checkpoints, areas they are forbidden to go to. If they are able to travel internationally, they have to apply for a visa to a consulate they often cannot reach, then travel for extra days to airports in third countries (Jordan or Egypt) before they can go. Israel has worked to link their state and the occupied areas to make them a unit for Israeli people. Israeli maps join them together: apparently Israeli school children do not know of the ‘green line’ that divides Israel and the West Bank. But for Palestinians they have cut up the country into many parts. There are clear movement restrictions between the West Bank and Gaza, but also between the West Bank and Jerusalem (East Jerusalem: this is not Israel). Palestinians are held up or stopped by hundreds of military checkpoints. There are checkpoints between towns and flying checkpoints (temporary military checks) at any point. These can be a check on identification, on goods carried or they can be a complete obstacle, holding up cars and people or preventing movement altogether. One of the systematic forms of control that the Israelis exert over Palestinians under occupation is a system of ID cards that divide and separate them. Palestinians are given their ID cards when they are 16 and they have to carry them at all times, as it is never clear when there will be an Israeli checkpoint and people will be asked to show these cards. 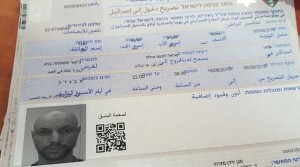 The ID cards divide people according to Israeli categories and (in a way reminiscent of South African pass laws under Apartheid) are used to restrict their movement. It’s important to note that the blue card given to Palestinians in Jerusalem is not the same as an Israeli ID card. It states that Palestinians carrying it hold residency rights in Jerusalem -not citizenship (see ‘Land and settlements’). On all colours of the card,, it also says where people live –at any point soldiers at a checkpoint can deny people the right to move out of their area. Abu Dis is surrounded by obstacles to movement. On its west since 2003 is the huge Israeli Separation Wall. On the south is a major Israeli checkpoint known as the Container (between Sawahreh and Bethlehem). On the east are major settlements, and to go north, Palestinians have to pass through Jaba’a Checkpoint and very often flying checkpoints near to the Israeli settlement of Maaleh Adumim. There are frequently ‘flying’ (temporary) checkpoints in Aizariyeh (on the way to Abu Dis) and within the town itself – see our Human Rights reports. Since the Israelis started to build the Separation Wall around Jerusalem they have worked to seal off Jerusalem very thoroughly from its suburb, and they have made special “terminals” for people to go through to get into the city. These are also divided. Zaytouneh terminal is for the use of West Bankers with green IDs. Only people who carry blue (Jerusalemite) IDs can use the al-Zayem checkpoint on the Jerusalem road leading to the settlement of Maale Adumim, they have put a checkpoint that can only be used by settlers and people with Jerusalem passes. To go to Jerusalem, people from Gaza or the West Bank have to get ‘permissions’ from the Israeli military – and if they are given them, take those pieces of paper to the heavy military checkpoints that encircle the city to see if they will be honoured by the soldiers there, with the chance to visit their capital city for fiercely demarcated short periods of time. The checkpoints are a real problem for the Palestinian economy as transport is slowed and unnecessary checks at frequent points on a journey – maybe every box has to be taken off and then put on again – add to the costs of production and distribution of goods. Checkpoints are military places where Palestinian civilians come into direct contact with Israeli soldiers and these are dangerous places. Beyond the issues of travel and time being held up is the knowledge that in the past few years, thousands of Palestinians have been arrested at checkpoints and hundreds of Palestinians have been shot and killed at checkpoints. The soldiers have been operating a ‘shoot first, ask later’ policy, and many young people have been shot at checkpoints and left to bleed and then died; hundreds of young people in the past three years. Living under military occupation, the Palestinians face many “closures”, regular and irregular – The Israelis give an order that a road is closed, an area is closed, Jerusalem is closed, the border is closed. Having to find a dangerous new way to travel or accepting that it is impossible are regular for Palestinians in a way we just don’t know in the West. Travelling from Palestine is complicated for Palestinians, who are divided by different kinds of Israeli-issued IDs and the rules for each one are different. Jerusalemites can use the airport at Tel Aviv. West Bankers need to travel east to Jordan and people in Gaza south to Egypt. Apart from Rafah (Gaza), the borders are under the control of Israel, and Israel oversees hours of procedures, hours of waiting – and raises tax from Palestinians who travel. Israel also regularly prevents people from travelling for their own reasons – there is no way to challenge this. This happened once to an Abu Dis headteacher travelling on a CADFA visit in charge of a group of children – The Israelis just refused to let him through. Returning to the country is possible for people with Palestinian passports but that leaves many millions of Palestinian refugees unable to return.